We always use salmon oil in our dogs' kibble. This is the best value I found and of course they love the flavor and we love the benefit it has for their skin. My dog's hair is shinny and no longer dry. I will contunue using the product. 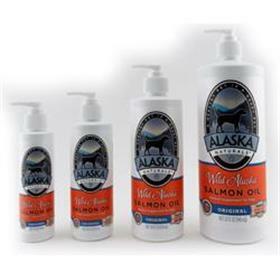 I have been using the Wild Alaskan Salmon Oil on my dog Cassie for about 9 months now. Last month I took her to the Vet for her yearly exam, and the Vet could not believe what a beautiful coat she had and asked what I was giving her. She then had an appointment immediately following the Vet at her groomers and her groomer just so happened to ask the same question. It truly was a great feeling to have her coat noticed and the compliments she received. It just made my day. Thank you for making such a wonderful product. This product was recommended from a friend, I purchased them from this site, I got them in 3 days. I gave to my dogs and they love it!!! You could see the difference in their coat in weeks, the coat looks shinny, healthier, I recommend this product to anybody.